Heroes Starter Resin Bases includes 6 custom resin base inserts for each model from the starter (Red Riding Hoodoo 30mm, Zombie Wolf 40mm, Iron Train 40mm, Androida 30mm, Ace of Wraiths 30mm, Solar 30mm). 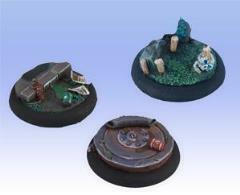 The base inserts are supplied unpainted. Not all bases shown on the picture.